With the vocal delivery of Dolly Parton and the moves of Shania Twain, 18-year-old Kelli Jones is making waves for her band, Belles & Whistles. They are a mother-daughter duo intent on making heartfelt songs like the old country days of Johnny Cash, Betsy Cline and Parton. Breaking away from a contemporary country sound dominated by songs about trucks, back-roading, drinks in hands, and shaking moneymakers, Kelli and her mother remain intent to make songs listeners can actually relate to, about real-life situations. During the Missouri State Fair last week, Kelli and her mother Jaymie let CMN interrupt their dinner before taking the stage for an interview. Kelli further described their process. Jaymie continued to say the duo has started traveling to Nashville for writing sessions where the two work with a stranger for four or five hours and come away with new material, quite the different from their process back home in Nebraska. 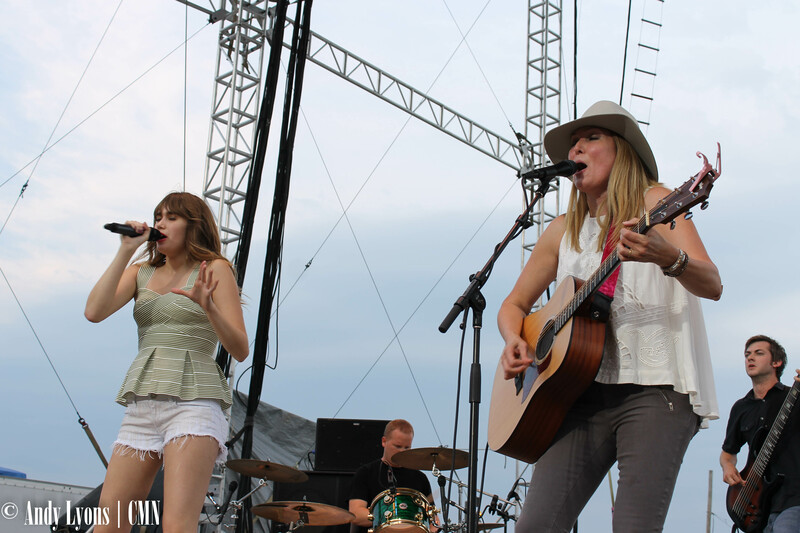 When the band took the stage, Kelli showed she has what it takes by commanding the attention of the crowd with the voice and moves of a country music veteran. They’ve only been playing for three years, but Jaymie described her daughter as an “old soul” who was a natural on stage. Kelli described getting into the music industry with a youthful excitement as she explained her journey with her mother. She started by going on the road with Jaymie’s old band and singing back-up. As she got older she was itching for a shot on stage and her mom trusted her to make the leap into singing for Belles & Whistles. Jaymie described the relationship between her and her daughter as professional when it comes to the band. They bounce ideas back and forth and function as two people with a lot of love and respect for one another as they find their path in music. When asked to describe themselves in three words, the pair had great answers for themselves. “I am crazy, I am independent and artistic,” Jaymie said. “Wow, I wanna hang around you, mom,” Kelli said with some sass. “Uh, sarcastic!” Jaymie said of her daughter with a laugh. “I’ll do passionate, calm and smart,” Kelli responded. Click here to listen to the entire interview with Belles & Whistles. For more on Belles & Whistles, visit their website here. Follow them on Facebook here.